South-facing, semi-detached bungalow on a small, quiet complex with communal pool; a short walk to beaches, restaurants and the town. Identical bungalow adjacent also available for rent. A south facing, semi detached bungalow in a quiet location, only a short walk from Flamingo beach, the town, the ferry to Fuerteventura and the harbour. In this central location a car is not a necessity, with the taxi rank and the bus stop only a short stroll. This property (totally refurbished for September 2008), is tucked away in the north-west corner of this small complex of 34 bungalows with mature gardens, communal pool, sun terraces and spectacular mountain views. The lounge is comfortably furnished with a double sofa bed, easy chairs, coffee tables, dining table and chairs. It is equipped with satellite TV, CD and DVD players. Some books and games will be provided for your entertainment. The self -contained open plan kitchen has a washing machine, fridge, hobs, microwave and ample storage space. It is equipped with Ironing board, iron, electric kettle, cooking utensils, crockery and cutlery. The twin bedroom has a fitted wardrobe, safe and drawer space. The fully tiled bathroom has a walk-in shower, vanity unit with storage space and WC. Other items supplied includes hairdryer, clother airer and cleaning equipment. A cot can be supplied on request. 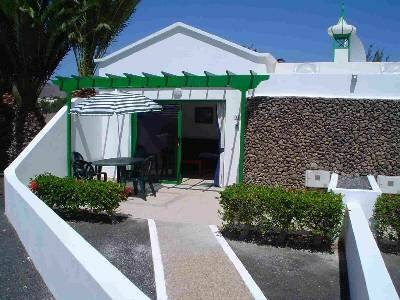 The property has a small private garden to the front, with a terrace that has sun loungers, table, chairs and parasol. From the bungalow you have a view across the pool and the mature gardens with palm trees. There are also spectacular views of the mountains from the pool area.